Either a mutual friend told him to call me, or her husband talked to my husband at work. Usually, their connection to me differed. Their reason for calling was always the same, though. It became increasingly more difficult to contain my answer to just one phone call. How have I kept MS from consuming my life and my dreams of becoming a mother? They were seeking that “one thing” I did, “one prayer” I prayed. HER GOOD DAYS: A Memoir of A Mother’s Leap of Faith by Saundra S. Fiscus published on March 8, 2012. 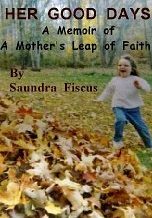 Saundra Fiscus is a beautiful, strong, loving, humorous, humble, honest and brave woman who wrote a truly touching story that will inspire you to appreciate the blessings in your life. She created an inspiring account of her love for a family while battling her difficult illness. Not only is it about her journey through living with an MS diagnosis, it is a love story as well. It is a blessing just to know San, her husband and her beautiful children and witness in person, how truly strong and important family, faith and friends can be. You can win a copy of this e-book and read this inspirational story. Just fill out the Rafflecopter form below. This giveaway will end July 25th at midnight. 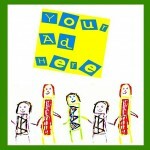 If you can’t wait to read this and you have a Kindle, you can read this e-book for free if you have Amazon Prime here. For details on purchasing this e-book yourself for only $2.99, go here. Congratulations to Samuel! His winning entry has been confirmed and the e-book has been sent. This giveaway is in no way endorsed by Facebook or Amazon. Open World Wide. Winning entry will be confirmed before contacting the winner. Winner has 48 hours to reply and confirm or another winner will be chosen. A HUGE “Thank You!” from the author of this memoir~to the bloggers who promoted the giveaway to those of you who entered to win. I have enjoyed checking in to my HER GOOD DAYS pages on both Amazon and Facebook to see all of the new faces of people showing their support. What a thrill this giveaway has been, and I am so grateful to My Kids’ Cool Mom for being so generous to offer it. Congratulations to the winner; I hope you enjoy the story. Keep in touch friends~with gratitude~San F.